We spend a LOT of time reading books and watching TV and movies in our household, and one game we love to play is “what if”. What if the ending had been different? The characters had had a stronger motivation? The main conflict had been more believable? This is what I call creative reading. Strong readers do this all the time. Passionate readers and viewers claim any story as their own and imagine the possibilities of twisting and molding characters to be more intriguing or more exciting or more heart-wrenching. It’s the joy after the ending. You may not have been the teen who wrote fan fiction, but you do this when you wonder what it would have been like if the girl hadn’t opened the basement door and gone down the stairs. 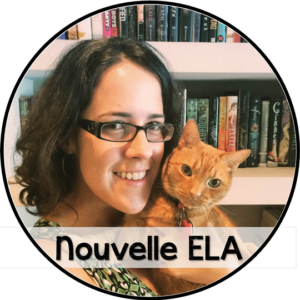 Our students deserve creative reading, too. We can share opportunities and guidance in imagining alternatives for each page of a novel. Reading is about absorbing someone else’s choices for a set of characters and events; creative reading is about reshaping a story to imagine possibilities. Practicing creative reading means taking ownership of material. 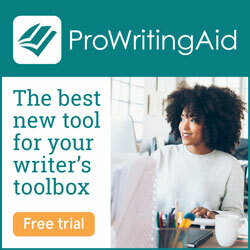 When you imagine alternatives, you’re writing your own story. It builds student confidence, endurance, and love for reading, while still providing space to play. 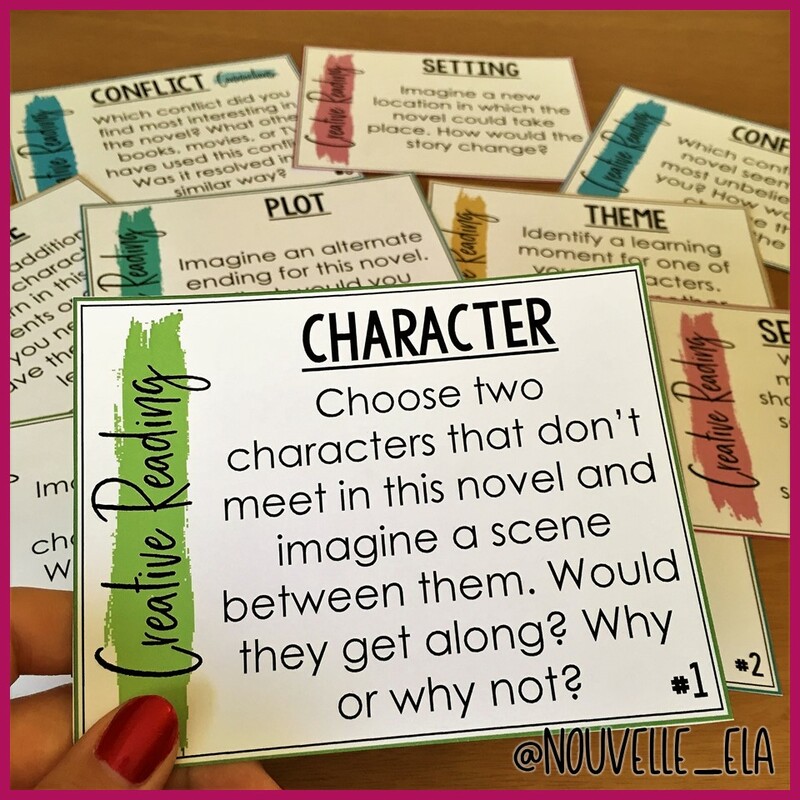 I developed these Creative Reading Task Cards to give students some structure as they practice this skill. Each card asks one focus question about plot, character, conflict, theme, and setting. You can use this concept as part of independent reading, literature circles, or with a whole-class novel. Students can sit in quiet reflection and think about different options for the story, or they can use the prompts to guide a discussion. Strong readers know what it’s like to get so engaged in a “what if” conversation with a friend that just builds and builds until we have a brand new, big and beautiful story. We can offer students the same opportunity. Some students need permission to imagine. They don’t know the “secret”—that strong readers already do this. You can model one a task as a think-aloud to show students how to begin. Assure them there’s no right answer and encourage them to experiment with different ideas. Students can practice creative reading for a couple of weeks before you ask them to do some creative writing. Challenge them to pick their favorite prompt or idea and expand it in writing. They’ve basically already done some brainstorming and planning! How great! This is such an easy activity to incorporate after any reading session. Creative reading also strengthens the foundation for analysis. This means it’s beneficial to a student’s long-term achievement. Once they can imagine different possibilities for how the story could have been written, students can analyze the author’s purpose in making the choices they did. 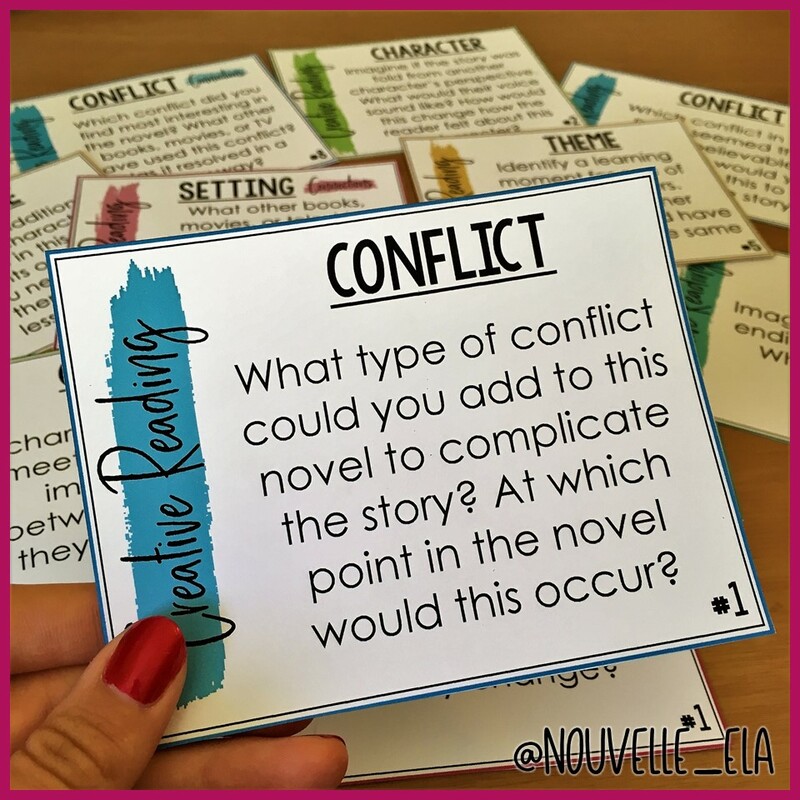 If you have questions about creative reading or want to share how you use this concept in your classroom, let me know in comments or reach out on Instagram @nouvelle_ela. Happy teaching!